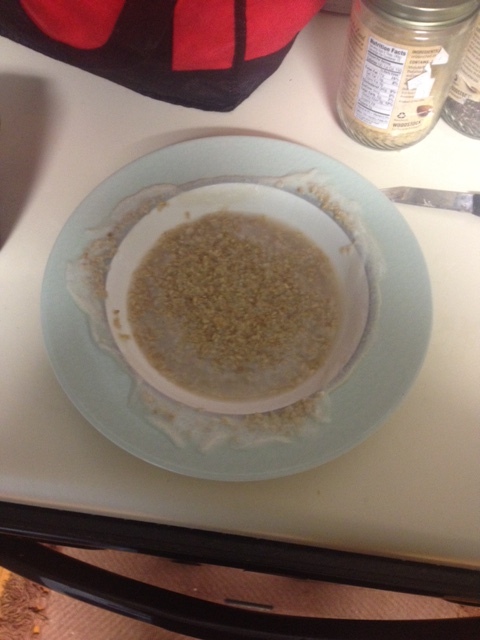 I know I am not the only one – experiencing Oatmeal boiling over when prepared in the microwave. I remember visiting my aunt and uncle in Richmond and my Aunt Judy prepared her oatmeal in a large mixing bowl to keep it from boiling over. She mentioned she doesn’t really enjoy eating her oatmeal from a mixing bowl – it is rather awkward. But – it never boils over! And at my parents there is an assortment of large (deep) bowls that I can use as my parents also eat oatmeal often. My mom had bought me a beautiful bowl at an artisan fair that was perfect for oatmeal. But one morning I was in a tizzy, and knocked it off the counter. With oatmeal in it, of course. Just proof that hurrying never helps but rather causes more problems for me. And I lost a bowl that, since it was a gift, meant something to me. But I have digressed. 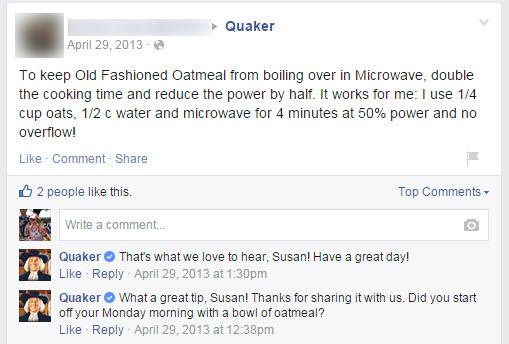 If you Google Oatmeal boiling over in the microwave, there are several hits, and suggestions. Most of them include using a larger bowl, but there were a few others, of which I am already doing including reducing the power and increasing the cook time as well as cooking in intervals. I also read about adding butter to keep the bubbles from forming properly (a little cooking science here). Of course, one can use the stove top. It can still boil over, but you can regulate the heat better (akin to lowering the microwave power) so it doesn’t boil over, and I tend to watch it closer and stir it more often. When I have time to cook it on the stove top, it really does taste better. And then there are many overnight oatmeal options. I tried it once with steel cut oats and it didn’t work too well as I still had to cook it for the same amount of time. And I still had to add my desired toppings the next morning. And I like my oatmeal warm. So for me, right now, it just isn’t worth it. Maybe if I didn’t work from home I would feel differently. OK – so I also didn’t have a jar I could seal but just covered it with saran wrap. Maybe that does make a big difference. I guess, now that I have saved a few almond butter jars, I should give it a try again. Regardless of the oatmeal type, I do have one other solution that I didn’t read. Instead of using a larger bowl, I use a bowl with a large rim – about 1” wide. When my oatmeal boils over the rim holds it all there and it doesn’t go on the bottom of my microwave. And so, with trial and error, and reading suggestions, I have found a method that works for me to cook steel cut oats in the microwave. I start at 70% for 2:30 ( i have been gradually increasing this and it is cooking it better, and still not boiling over). And I let it set after – the longer the better, but often it is just for 1 minute. Then for round two I cook it at 60% for 1:30. I have also been increasing this sometimes. But it is in round two that it tends to boil up (not over, but up on to the rim), so I am working on extending the first round first. And then add my desired toppings for the day. One thing I have learned – oatmeal is a plain base – just like rice or pasta. And you can add whatever you want to make it wonderful. I have actually seen dinner recipes with oatmeal instead of rice. I am not suggesting going that crazy but – don’t limit yourself to brown sugar or raisins either. You are missing out on a wonderful world of tastes! I use different protein powders, Greek yogurt, bananas, chia seeds, ground flaxseed, coconut flakes, my nut butter of choice, and available fruit – in various combinations. And it is always yummy.